12 Noon: “If I sleep until 8 p.m., even better. Someone can get the laptop for sound check, but otherwise, I’m to be left alone.” So begins a weekend of everyone being segregated to hotel rooms in Hollywood, our busses still parked outside of Avalon for who-knows-why, other than to store my moving boxes that are en route to Miami. 9:45 P.M.: A press conference is held at a nearby restaurant. The legendary radio jock Swedish Eagle is one of the attendees. I sit back and snack on a cheese plate, while actual journalists do work. Markus announces Scream 2 and its accompanying tour in the Fall. Uh-oh…. 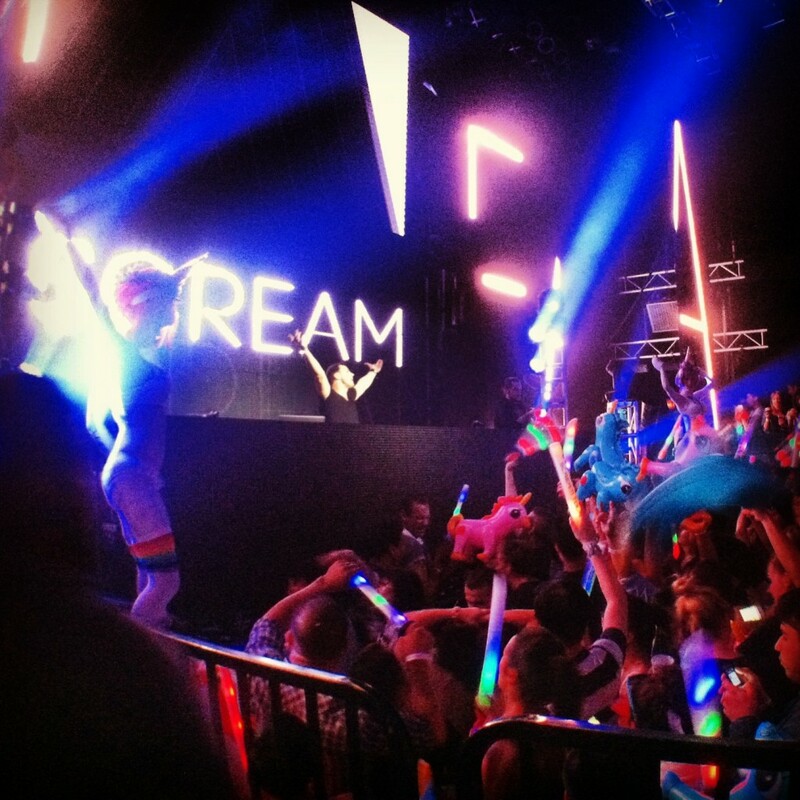 11:30 P.M.: KhoMha is in the middle of his set in front of a thousand people…or two. I find the schedule for the night, and am exhausted just reading it. They’re playing until 8 A.M.? No wonder Markus wanted to sleep all day. I, on the other hand, got no nap. He can have his tour back. 12:30 A.M.: The club is absolute madness, including our VIP area, and I am scared. I escape to the back of the club where there is some breathing room. It isn’t long before I’m approached by a dude practicing one of my biggest pet peeves. (Boys, don’t walk up to a girl and just blurt out, “What’s your name?” Introduce yourself like a gentleman.) I run to find another safe place, pushing past a stream of people coming into the club, and am stunned to find a life-sized unicorn. I continue to our merch booth, and wish I could be back behind it for once. 1 A.M.: Markus’ intro drives me back to the main floor, and I’m in total awe. During sound check, I hadn’t noticed that we also brought in LEDs for the ceiling, or that there were even more wrapped around the back balcony. They are strobing brighter than the sun. I turn around to find the head of DC3 behind me, smiling at his work, and give him a high-five. 8 P.M.: End-of-tour dinner. Toasts ensue, congratulating Markus on the success of the tour. It’s a proud, yet somber time. I love so many of these people, but I don’t really want to talk to any of them now. It’s a form of detachment, I guess, to protect my feelings in the end. At the same time, I want to have short cuddle sessions with all of them, and I can’t help but think of one of my favorite movies, the Madonna: Truth or Dare documentary. I had never understood the intimacy she had with her crew, so much that she said goodbye to them while they were in her bed. All of these weeks spent in close quarters with people working toward a passionate goal will produce that kind of familiarity. Not in a sexual way; like, in a platonic, slumber-party way. 11 P.M.: Once again, I check the schedule. It only lists Markus as going until 4 A.M., but then reads, “What curfew?” I am scared again, but the crowd has a more chill vibe than last night (younger and less intensely serious), so I feel more energetic. My friends from Phoenix are sending #ScreamBusTour tweets, so that I can read them on the projection screens on the side walls. Downstairs, I discover all of the blow-up unicorns stuffed into plastic bags, and can’t handle their giant, innocent eyes. I rescue one like the dork that I am. 3:30 A.M.: Markus and KhoMha are dishing out a mean hour-long tag team set, and our tour manager is finally broken. Dead asleep on his “prodo” desk, he may or may not be cuddling with a blow-up unicorn. 9 A.M.: We’re off to Miami. In the car on the way to the airport, Markus is already making a to-do list for the Fall tour, despite having gotten zero sleep. He doesn’t quit! Viva la Scream Bus Tour!